Dental Implants Specialists in New York City, New Jersey, and Long Island. News: Why Is My Mouth So Dry? Patient Information – Pre and Post Treatment Instructions, Patient Forms, etc. How do Dental Implants Work? The presence of teeth keeps the maxillary sinus in place. 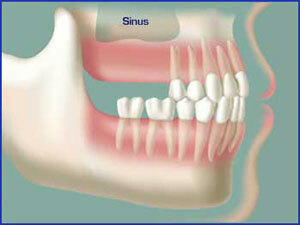 Missing top teeth gives the sinus (which contains slight pressure) the opportunity to expand. The maxillary sinus expands into the edentulous area, subsequently causing bone atrophy. The expanding sinus destroys surrounding bone. Bottom teeth continue to erupt and traumatize soft tissue. The contents of this website are for informational purposes only, and are not intended to be a substitute for professional dental advice, diagnosis, or treatment. Please make an appointment at one of our four NY and NJ dental implant centers in Manhattan, Long Island or Nutley NJ for a free dental implants consultation and a treatment plan specifically tailored to you.